Using Lumileds Luxeon TX LED's and featuring our superior thermal management system we offer ultimate optical control which results in maximum energy savings. Find the full product details on pages 2 & 3 of the attached brochure download. Arrow Mini LED flood light range can be used for general lighting applications when a low power solution with a lumen package of up to 13,000LM is required …………a low-cost solution without sacrificing performance or product quality. The Arrow Mini high performance professional led flood light uses patented cooling technology which maintains a low LED chip junction temperature and thus delivers long life. 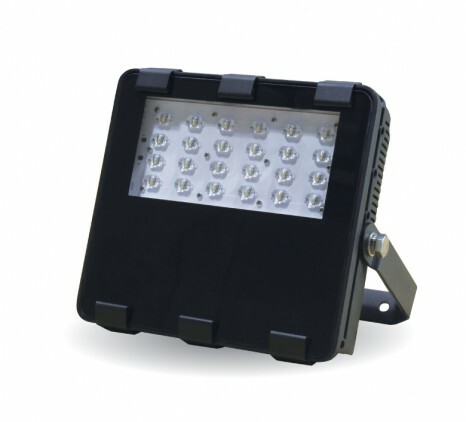 Using the latest LED chips from leading chip manufacturer Lumileds, the Arrow floodlight offers a high lumen per watt value reducing your energy usage. With a choice of 10 optics, we have a photometric footprint to match any application or requirement. We can provide photometric files for your own designers or can offer in-house lighting design to demonstrate the superior performance. Here is an article which features our fixtures in an indoor lighting application but equally they are rated for external lighting.